In late September I attended a memorial service for William M. Fitz-Gibbon, a retired public school teacher who had passed away a few weeks earlier, just short of his 78th birthday. 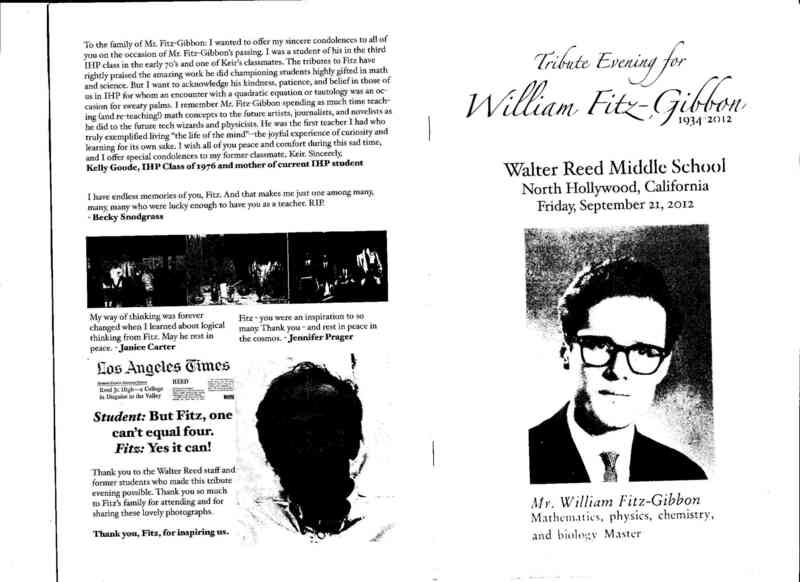 Without doubt Bill Fitz-Gibbon—“Fitz” to everyone—was the individual who had the greatest academic influence on my life, and my feelings were shared by many others, with hundreds of his former students from the last 35 years attending the service, held at Walter Reed Junior High in the San Fernando Valley area of Los Angeles. But what made his achievement so remarkable is that his decades of teaching had almost entirely been spent—with only mixed success—trying to climb up the down escalator of American education. Unlike most MIT science graduates with exceptional IQs, he was drawn to teaching, first at private schools in Switzerland and England and later in suburban Los Angeles. He decided the existing system was inadequate for the most able and saw the need for an academically elite public school similar to Stuyvesant and Bronx Science in New York. 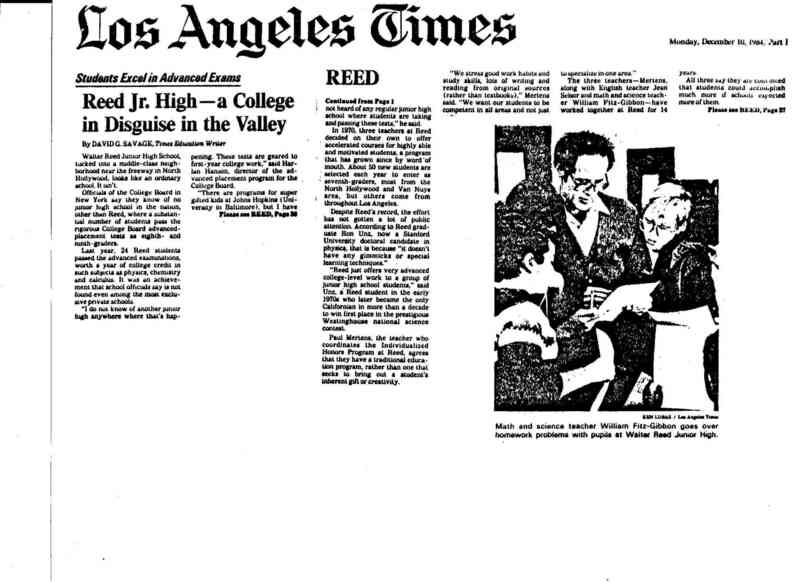 So in 1971, with the approval of his principal and working with two other teachers, he established his major legacy, the Individualized Honors Program (IHP) at Reed in North Hollywood, taking in some 30 seventh graders, mostly from the local area but with some drawn from across Los Angeles. When these students moved up to the eighth grade, a new group of seventh graders was enrolled, and this was repeated again the following year, with IHP now containing three teachers and close to 100 seventh through ninth graders, representing the tiniest sliver of the half-million-plus Los Angeles Unified School District. And I had become part of that sliver, entering IHP as a seventh grader in 1973. Within a few years the program had begun to achieve impressive results, with eighth and ninth graders passing Advanced Placement exams for college credit, the same sort of APs normally taken only by the top 11th and 12th graders at other leading schools. Reed’s IHP became the first and only junior high school in America where a sizable fraction of the students were doing college-level work. The obvious next step—part of the plan from the very beginning—was to extend the program to the upper grades, thereby creating a public school whose achievements would rival those of any in the world. But over three decades it never happened, and therein lies a tale. Although LA schools had never enjoyed the reputation for academic excellence found in some East Coast cities, they had also never faced the same sort of bitter racial struggles. The suburban Valley was entirely middle class and well over 90 percent white in those days, and although the 1965 Watts Riots had been horrifying, they had taken place 30 miles away over the hills—events you saw on television rather than experienced in daily life. Meanwhile, a long political battle over proposed forced busing for racial integration—possibly involving daily round-trips of 50 miles or more—became the absolute centerpiece of educational politics and provoked a white exodus from the schools. Unlike on the East Coast, virtually all ordinary Angelenos had traditionally attended local public schools, but over a decade or so a substantial fraction nervously switched to newly established private academies. By the time the busing proposals finally died in court, the LAUSD had suffered a huge loss of its previous middle-class enrollment, and the school board had become ideologically polarized to an extreme degree. This was the landscape in fall 1984 when I returned to California as a Stanford grad student in theoretical physics, after having spent years away on the East Coast and in England. With the IHP track record now long and impressive, I believed the time might be right to create the intended high school, and working with the IHP teachers and a couple of other IHP alumni, we began the project. At first, things went extremely well. IHP’s academic results were amazing, but had never been noticed by the media, so sending out a few simple press releases quickly attracted outstanding coverage, including a front-page story in the Los Angeles Times and a full-page article in Time. With such strong media coverage, we gradually recruited an impressive advisory board of supporters, including six Nobel Laureates, the president of Caltech, the president of the American Physical Society, a past chairman of the U.S. Atomic Energy Commission, and a former president of the Harvard Law Review. Leading local high-technology companies endorsed the effort, and prominent university professors expressed interest in teaching at the school part-time, including a Caltech Nobel Laureate. By 1986, we had developed an outline of our proposed School for Advanced Studies and its full curriculum. Even more importantly, we had attracted the backing of the Los Angeles-based Weingart Foundation, which offered to provide $3.5 million in supplemental private funding to help establish the program. All that remained was receiving authorization from the Los Angeles School Board, but that last hurdle proved insurmountable. For nearly two decades, the board had been bitterly split down the middle between right-wing and left-wing factions. Although the conservatives generally supported our effort, they hardly considered it a major priority, while some of the “progressives” hated it, viewing it as the worst sort of educational elitism. In particular, they demanded that students be selected by strict racial proportions, which we believed would destroy the program. 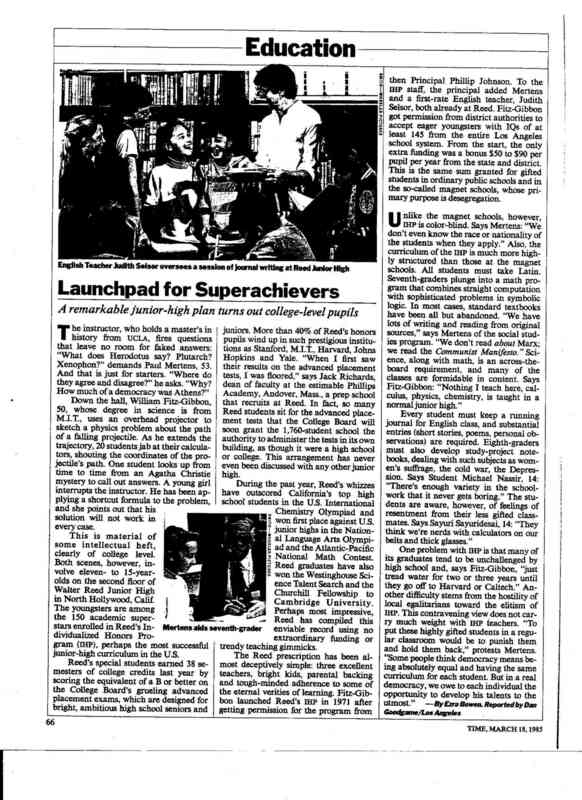 One of the front-page newspaper articles quoted board member Jackie Goldberg as saying, “If they don’t want quotas, they don’t want a public school.” With LAUSD refusing to allow the school, we explored various other options, but none of them materialized, and our efforts eventually faded away. The Los Angeles School Board members went back to fighting over unionization issues and planning their future races for city council. Bill Fitz-Gibbon spent another 20 years teaching at IHP, always hoping to extend the program to high school, but with no more luck than before. And I became so disgusted at our failure that a college friend finally persuaded me to take a summer job writing software on Wall Street, a decision that unexpectedly marked my permanent defection from a planned academic career in theoretical physics. 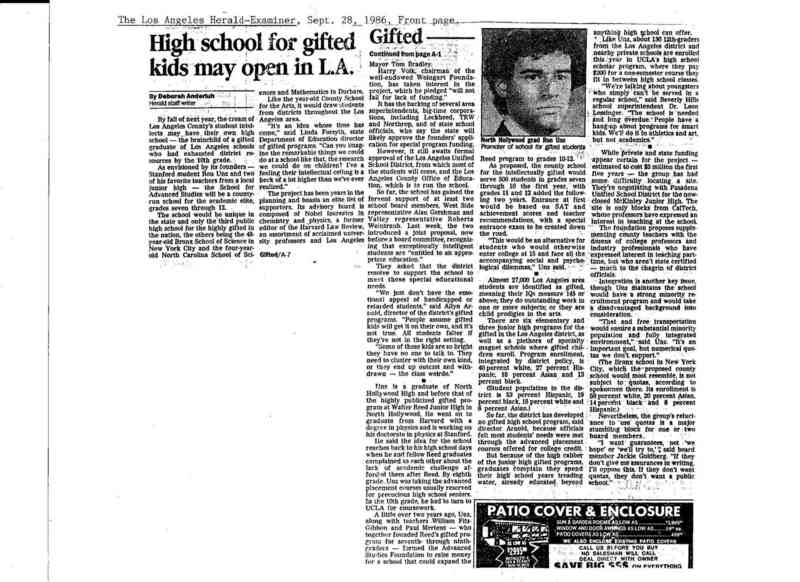 The only long-term consequence of our years of effort was that ABC soon created a successful television sitcom called “Head of the Class,” which ran from 1986 to 1991 and featured ten ultra-bright students in a public school program called “IHP.” The show launched the career of Robin Givens, Mike Tyson’s future wife, while one of the other students was actually played by a Reed IHP graduate. Naturally, the show itself was set in New York City, since everyone knows that a high-powered academic program like that could never exist in an educational backwater such as Los Angeles. This entry was posted in Meritocracy, Published and tagged American Conservative, IQ, Meritocracy. Bookmark the permalink.